Photo courtesy of Eddie M.
Oakhella throws small-scale music festivals at the Bottoms Up Community Garden. There's a lot more to the Lower Bottoms neighborhood of West Oakland than what you can see from BART. It's a neighborhood stereotyped by economic blight and crime, yet it's simultaneously ripe with the sort of tensions that come with rapid gentrification. At the same time, there's community engagement, creativity, and joy. One of the better examples sits on the corner of 8th and Peralta streets: The Bottoms Up Community Garden, an urban farm full of chicken coops, vegetable beds, a functioning kitchen, and, briefly, a morning breakfast spot managed by Oakhella co-founder and chef Seneca Scott and garden founder Jason Byrnes. "We wanted people to just interact with it in as many ways as possible," Byrnes explained. Now, it's grown past pop-up breakfast sandwiches. "This is beyond anything I could ever dream of." On Sunday, April 29, the Oakhella collective will celebrate the two-year anniversary of its original daytime party, also called Oakhella. This edition will be its biggest party to date, back where it all started at Bottoms Up Community Garden. Centered around the trinity of music, art, and food, the free event will feature live art performances, local craft vendors, food sourced from the garden itself, DJs throughout the day (many of whom are Oakhella organizers), and live musical performances from the Bay Area's Futurelics and Honey Gold Jasmine as well as Blvck Spvde from St. Louis and ScienZe from Brooklyn. 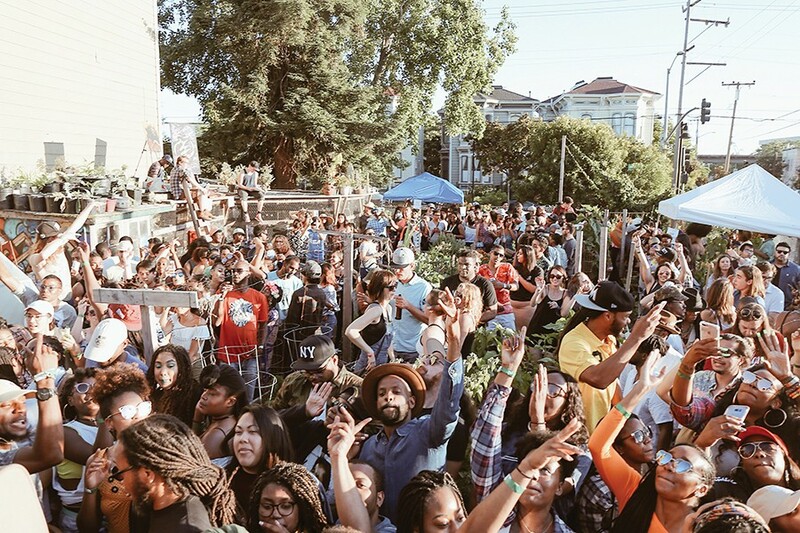 The very first Oakhella party happened in 2016, initially as "Oakchella," when collective members realized their party landed on the same weekend as the massive Southern California festival. A series of online Oakchella promotions quickly went viral before a cease and desist from Coachella organizers forced the collective to delete their published content and "drop the C," settling on the even more East Bay-appropriate name, "Oakhella." The group continued to sporadically throw Oakhella day parties — seriously DIY affairs — and produce other events. For Oakhella's two-year anniversary, there will be a real stage with a professional sound system laying down the soundtrack for the officially sanctioned block party. It promises to still have that DIY community vibe, though. "We could never ever have an event like this in New York," said Oakhella music director Fresh Daily. Arriving in Oakland from New York, Fresh Daily and art director James Shields found familiar constraints at local clubs. "Safe space looks a lot different than cops and metal detectors and dress codes," said Shields, who coined the phrase "Nightlife Apartheid" to describe these common restrictions. He sees Oakhella as "an action-oriented feat of combating Nightlife Apartheid through partying in your own space," he said. "That's what makes the garden and Oakhella special — it literally is the community space." You can throw stones to where the 10-person collective lives in the neighborhood. While a mix of Oakland natives and new transplants, the members of Oakhella are mostly people of color representing a cross-section of multifaceted artists, organizers, and educators who care about making sure Oakland feels like Oakland. "Just this past year, I know all of these businesses and storefronts that used to be owned by people of color, that used to be POC-centered spaces, that are literally disappearing. I felt like an outsider in my own hometown," said Oakhella co-founder and Oakland native Bijou McDaniel (DJ Kream). "For me, being a part of Oakhella was a way to fight gentrification, or at least, offer a solution in which the people who exist here already and the people who are coming into this space can have a communal area where they can have conversations." Over the years, honest direct engagement with local community members and Oakland police has allowed Oakhella to thrive. "It took a lot of work to be able to have that event," Scott explained. "You can't just go somewhere and do that overnight." That work is also evident in who's present: women, families, people of color, queer folks. "More than half of our attendees are female-identified," said Trey Amos (Drow Flow). "For women to feel like they can come here, party with their homegirls — that's not something that happens a lot of places." When MC K-Swift moved to the block a few years ago, he visited the garden and a volunteer immediately told him, "This is your garden." Now, as a member of Oakhella, he wants the joy and power he felt in that moment to be infectious. "I hope Oakhella gives people the opportunity to have that kind of sense of belonging to the neighborhoods and to the community, and that the things that are in their communities belong to them," he said.